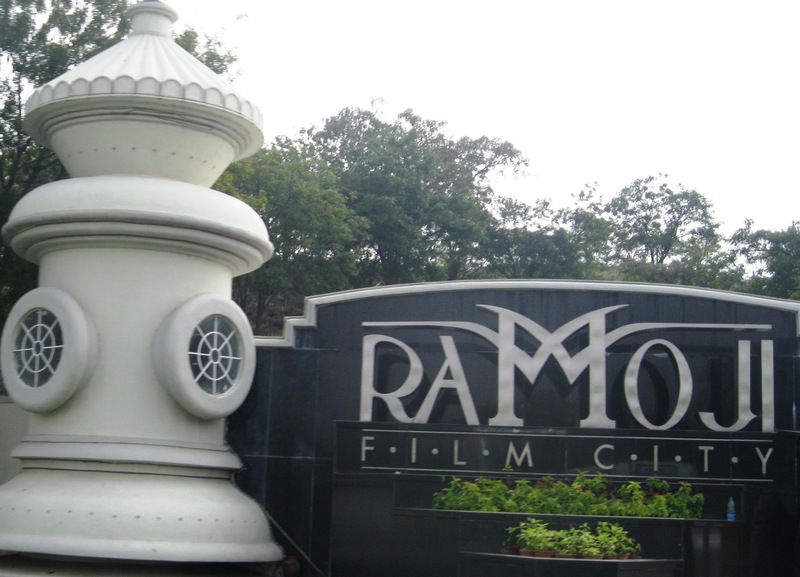 I had missed the opportunity to visit the famed Ramoji Film City on my numerous visits to this southern state in India. But 2014 ensured I had my fill of entertainment. RFC, the world’s largest film studio complex, is situated atop a hillock that affords all visitors breathtaking views of the entire village. Hot Tip: You’ll do well to arrive before 10AM as the tickets are always in short supply and booking closes by 2PM. After you buy your passes, you’re driven to the studio complex area in what looks like a London bus! Each bus stops right in front of a miniature cowboy town that resembles the sets of Wild Wild West. 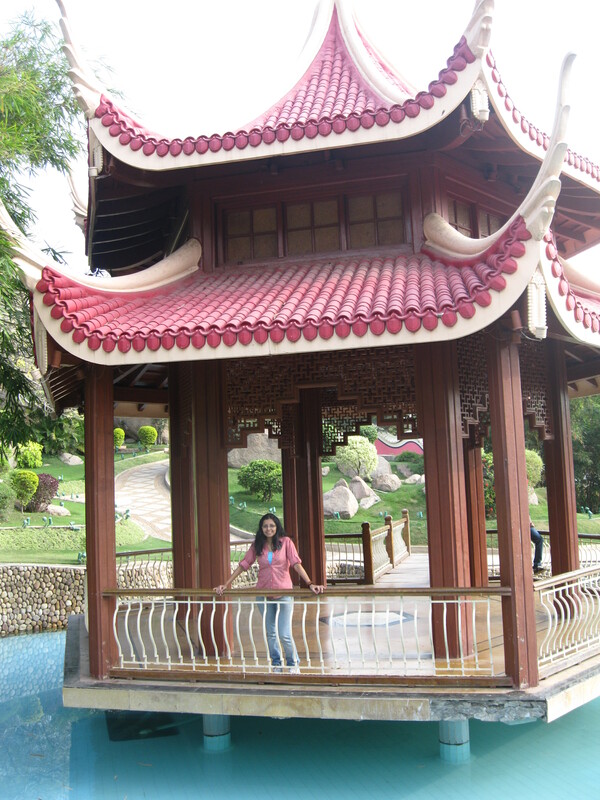 (This is where the popular song, Tha Kar Ke, from Golmaal Returns was shot! 🙂 ) There’s plenty of scope for photo-ops, especially when there are a number of prop-sellers that entice you to buy their cowboy hats and giant goggles. 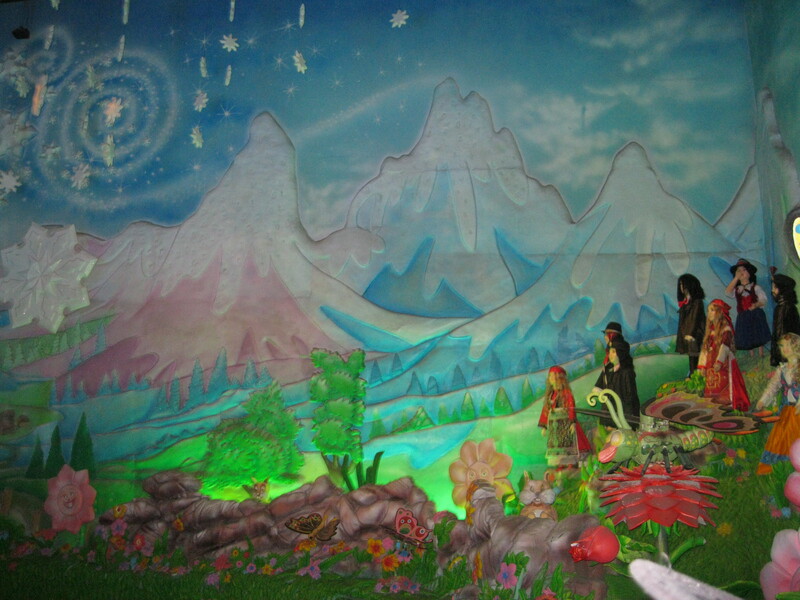 Kids will love the place for its vibrancy and colour! 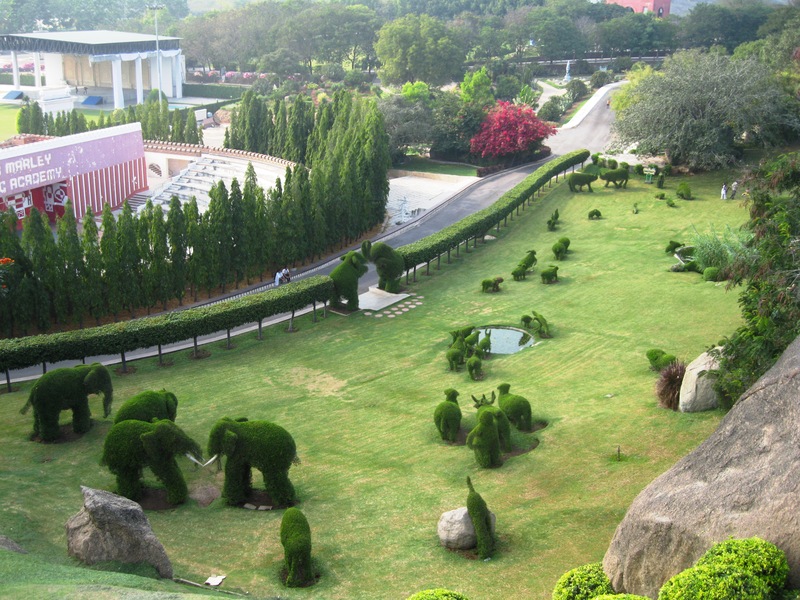 Spread over 2000 acres, RFC lets you gasp at the Eiffel Tower and admire Japanese roofs within an hour! As you guessed, it isn’t possible to explore the entire property on foot, so they have shuttles to take you around this wonderland of sorts. The guide that escorted us on the tour was a talented orator who made us laugh at his witty one-liners as he described each set. Our shuttle stopped at the artificial Amer Palace (here you can read about the real one that I visited in 2012) and I had the opportunity to compare it with the original one in Rajasthan. I could hear the faint tunes of Rajasthani folk music from where I stood, and I decided to walk towards the source of the sound. I was mindblown by what I saw! I witnessed a live Kalbelia dance performance in the middle of a Telegu village! 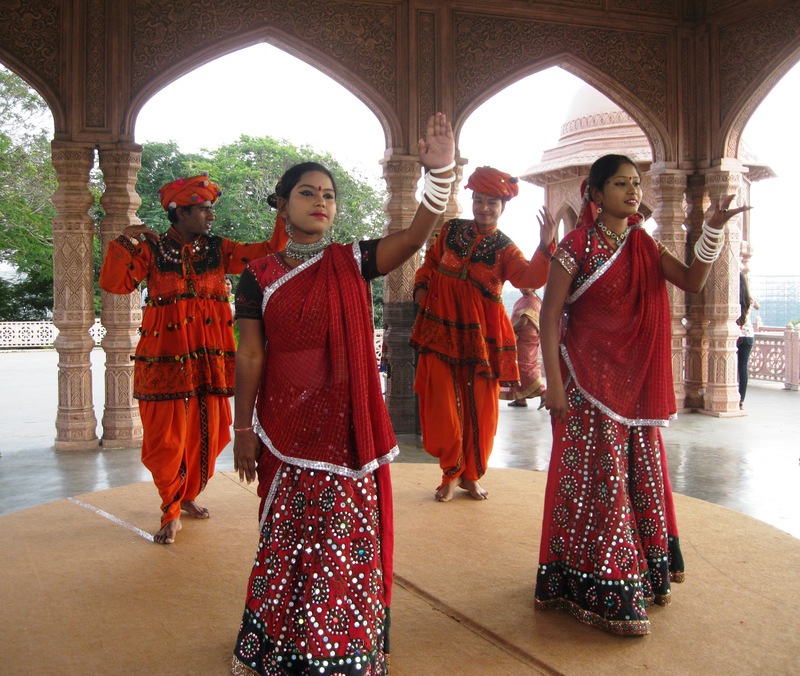 The dancers looked exotic, dressed in their traditional garb, and decked up in Rajasthani ornaments. With the music still ringing in my ears, I couldn’t hear my stomach grumble. It was only after the dancing stopped that I realized I was hungry. RFC (am I the only one who thinks it sounds like KFC? 😛 ) has half a dozen restaurants that cater to different tastes. We ate at Alampana, which claimed to serve authentic Hyderabadi cuisine, but the food cut no ice with me. If you’re the type that salivates for street food, there are a couple of stalls that sell pani-puris and frankies in front of Dil Se (in the pic above). In the afternoon, to avoid the sun that shone directly above us, we hopped onto the toy train in Filmy Duniya. 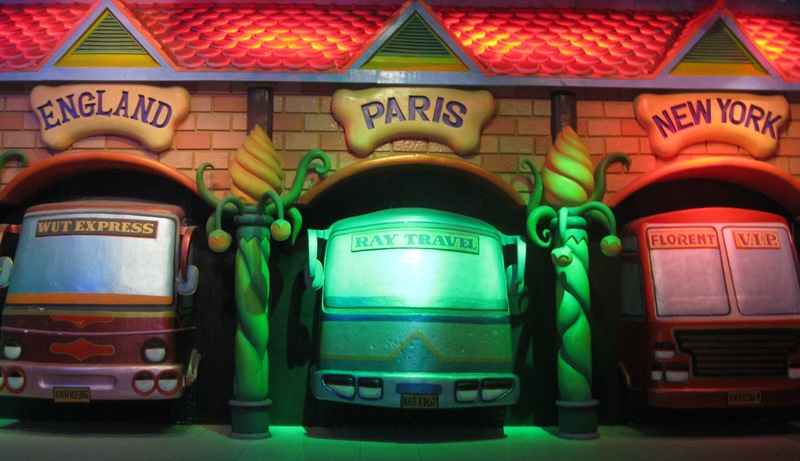 This roofless train chugs through a long, twisty tunnel and takes you into the world of animated characters and crayon-coloured backdrops. I felt like a little girl enthralled on a joyride. RFC is best enjoyed when you’re in primary school, and I appeal to all the mommies & daddies reading my post to take their young ones to tour this film city before they reach high school. We tunnelled through snow-capped mountains of the arctics, saw african tribes dance to congo-beats, waved at the Thai royalty, and dodged the huge camels that the Arabs held with their harness. After what seemed like an overdose of light, sound and colour, we alighted the train and walked into a room full of even more garish lights and sounds. 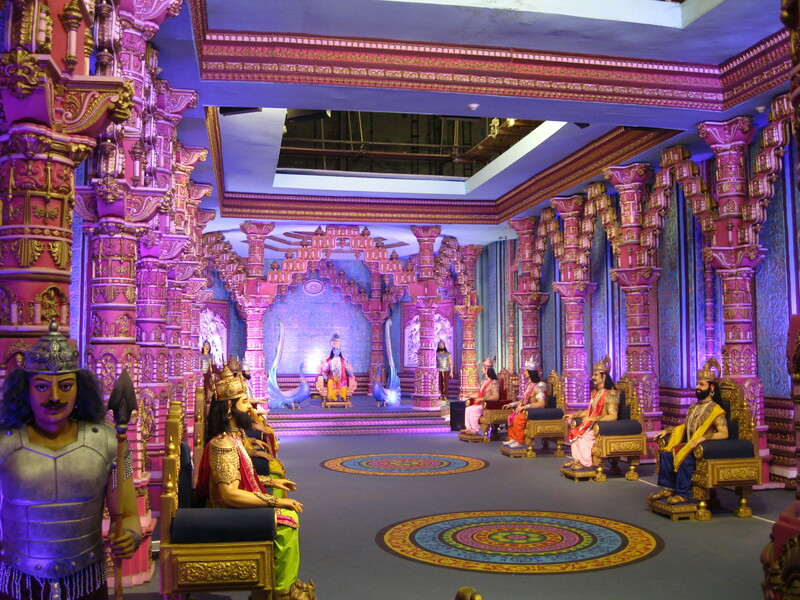 The scene was of a royal Indian palace where most mythological TV serials are shot. Real or not, the courts appear larger than life, and the jewelled pillars dazzle in the neon lights. I felt a little lightheaded in the violet lights of the king’s court, and knew it was time again to go outdoors. 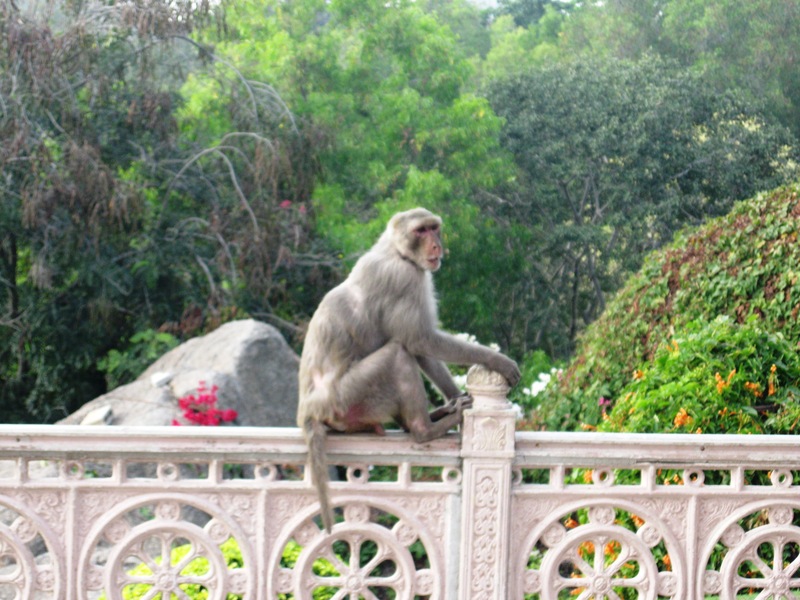 This monkey followed me all the way to the Japanese garden and managed to scare away the others! Good thing, isn’t it? Considering how I got the entire place to myself! 😀 The Japanese park was a treat to my eyes with its undulating meadows and clear waters that flowed under tiny bridges. I lingered here for quite some time before I moved to my final destination. 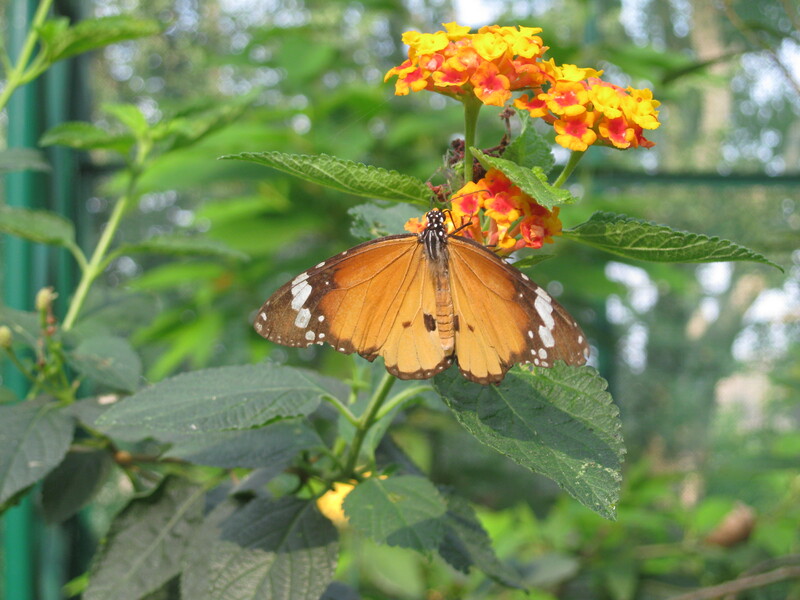 The Butterfly Park beckoned to us with its greenhouse-like enclosure and sweet smelling flowers. I surprised myself when I managed to identify a couple of butterflies even with the camouflage. RFC also has a bonsai-park and the most amazing collection of bonsai I have ever seen! Wear comfortable walking shoes as you’ll be clocking quite a few miles on this trip. It’s hard to completely see RFC in a day, so be judicious with your time if you only have 1 day with you. It’s very hot up here at the top (even in spring), so get a hat with you and don’t forget to spray some sunscreen! Monkeys, no matter how innocent they seem, can be dangerous. So, use your judgement and follow the crowd when you have a monkey eager to accompany you. Don’t miss the closing ceremony (in front of Dil Se… at 5PM)! 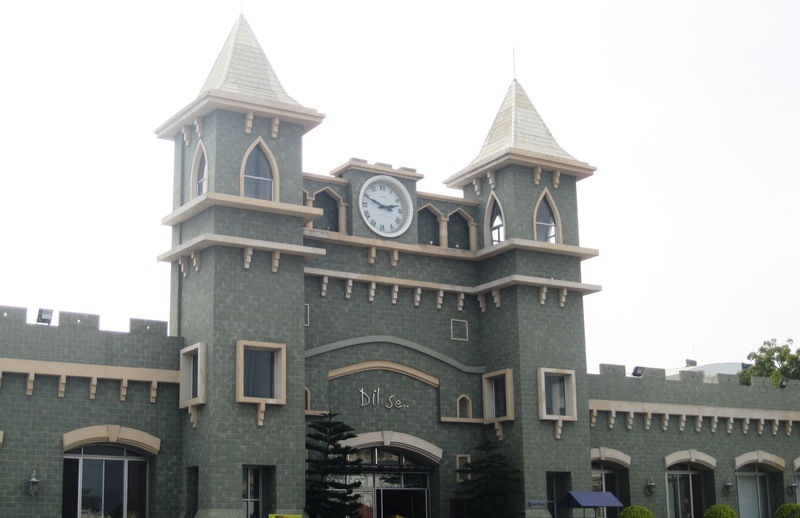 This entry was tagged Anajpur, Andhra Pradesh, Cowboy Town, day trips near Hyderabad, Film studio in Hyderabad, Film studios in India, Golmaal Returns, Japanese Garden, Movie sets, Rajasthani Dance, Ramoji Film City, Shooting, Tollywood, weekend getaways from Hyderabad, weekend trips in Telangana. Bookmark the permalink. Sounds like a mish-mash city of sorts, with different flavours and experiences mixing together harmoniously – would be great if you could add some sort of map as well? Or a guide using the path you followed? That’s great. I was suggesting because knowledge about the extent of the center along with locations tagged with pics will make for a clearer reading experience-just suggesting. Thank you, Mayank! 🙂 I personally feel great when I take some time off from work and post a travel-update here. So exciting!!! It’s like DIsneyworld!! 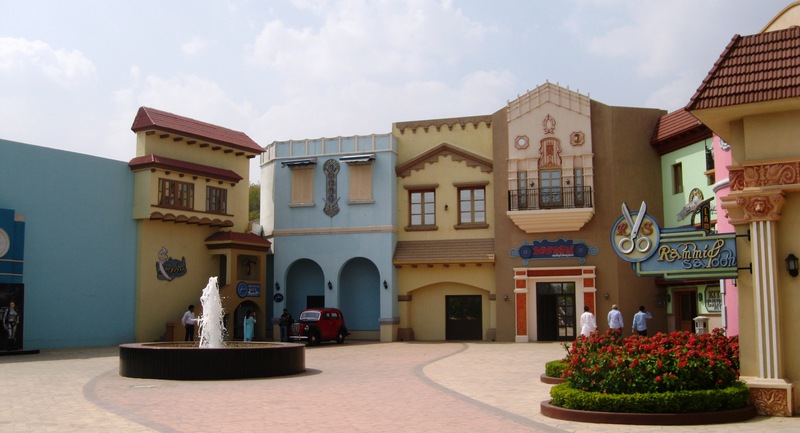 I’ve been to the film city in Chennai, but I remember nothing except going on some rides 😉 This seems so much bigger and better. Wow!! It is very wonderful and attractive pictures. Really it is very pretty. It is interesting to place. Thank you so much this Article.